Up-and-coming Guelph musician David Hollingshead pulls his inspiration from a classical upbringing and current jazz studies. Learning piano from a young age he progressed through the Royal Conservatory of Music system. However, he eventually became enamored with Jazz and enrolled at Mohawk College later continuing his degree at Humber College where he has studied with the best in Canadian Jazz. His playing can be described as energetic, playful, and pensive garnering influences from Herbie Hancock, Brad Mehldau Wynton Kelly, and Shai Maestro. 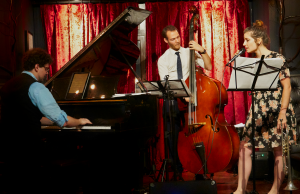 David Hollingshead (piano), Devin Patten (bass), Adina Vladsov (vocals).